>California Says, We Are Going To Pump You Up! Governor Arnold Schwarzenegger delivers comments to NARUC July 21st in Sacramento. Photo courtesy Justin Short. The Hub will be funded at up to $22 million this fiscal year and is one of only three that will receive funding this year. For more information visit: http://www.energy.gov/news/9243.htm. 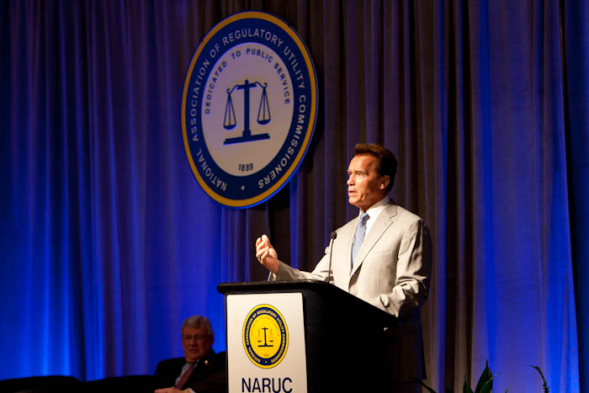 Governor Arnold Schwarzenegger delivered remarks at the National Association of Regulatory Utility Commissioners (NARUC) Annual Summer Committee Meetings on July 21, 2010. (Sacramento, Calif. July 21, 2010) …And this is something that we have had in California. We have had consistency. And this is why we have to go and do everything that we can to continue with that consistency. Why? Because we have to be and all of you have to be an inspiration to the federal government to create that consistency, because the federal government is a disaster when it comes to energy policy. They haven’t had an energy policy for decades. We all remember when Jimmy Carter came in with some brilliant ideas about solar and about doing research and exploration of shale oil and wind and all of those kind of things. The next administration came in and said well, wait a minute. A barrel of oil is down to $10. Why are we futzing around with all this stuff over here when we can just buy the oil? And the policy was out the window. So this is not consistency, so people don’t know, should we invest in this or not invest in it? They don’t know. They’re confused. And right now, several decades later — and I’ve watched all this since I’ve been in this country, I can tell you — it is really amazing that today the federal government still doesn’t have a policy. They have no idea how much they’re going to rely on more nuclear plants, what is their portfolio, their goal when it comes to renewable. No idea. No one can answer that question, how much should we reduce in greenhouse gases, what should our standards be, what kind of cars do we want 10 years, 20 years down the road? None of those things anyone can answer.